• Combine equal amounts of potato juice and lemon juice. You may add a little honey, too. Leave this solution on your face and neck for about 10 minutes to brighten your skin. As both these ingredients absorb excess oil, this recipe is recommended for those with greasy skin. • If you have dry skin, make a facial mask by smashing a boiled potato and adding two teaspoons of milk powder and a teaspoon of sweet almond oil in it. Spread this paste on your face and wash it off after 20-25 minutes to get soft, glowing skin. • Prepare a homemade cleanser by blending a quarter cup of chopped cucumber and 1/8th cup of chopped raw potatoes in a blender for 20-30 seconds. You need not peel the cucumber and potato for this facial mask. Next, add an egg, a quarter cup of plain yogurt, and a teaspoon of baking soda in it. Blend the mixture again for a minute. Apply this mask on your face and neck for 10-15 minutes. Then, rinse it off with tepid water. • Blend a potato along with two to three tablespoons of applesauce. Apply the resultant paste on your skin for 15-20 minutes to maintain younger-looking skin. • When dealing with pimple marks and acne scars, prepare a face mask by combining potato juice, lemon juice, and fuller’s earth to get a paste. Smear this paste on your skin. When it dries, wash it off with lukewarm water and a cold water rinse. Finally, follow up with a moisturizer. Here is a video showing how to use potato for beauty. • Keep a few potato slices in a refrigerator for at least 30 minutes. Place these slices on your eyes to soothe sore eyes. • Peel a potato and cut it into a few slices. Place these slices under your eyes for about 20 minutes and then rinse the area with tepid water to lighten dark circles naturally. 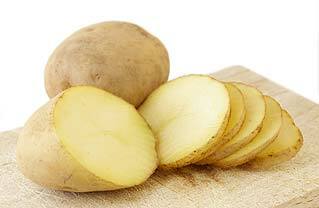 The liquid starch present in potatoes contains an enzyme called catalase, which helps reduce under eye circles. • Regularly applying potato juice on skin for 15-20 minutes is highly beneficial for getting clear skin. It heals acne, blemishes, and sunburn. Moreover, it helps keep wrinkles and fine lines at bay. • Rub a raw grated potato on your skin, leave it for half an hour, and then rinse it off with lukewarm water to facilitate skin whitening. It reduces facial puffiness, too. Follow this treatment three times in a week. • Simply applying boiled potato peels on skin helps relieve issues like burns and inflammations. It soothes swollen skin tissues. In case of itching and insect bites, place a slice of raw potato on the affected area for minutes. Repeat this procedure several times in a day. • To make your hair grow faster, use a homemade hair mask prepared by mixing two tablespoons each of potato juice, aloe vera gel, and a tablespoon of organic honey. Massage this mask on your scalp and rinse it off after a couple of hours. • You can also prepare a hair tonic for grey hair by using potatoes. For this, you need to peel five medium-sized potatoes, boil them in water for half an hour, and strain the liquid when it cools. Finally, add one teaspoon each of rosemary and lavender essential oils in it. Rinse your hair with this solution after shampooing your hair. I have oily skin, so what home remedies i should apply to control it? I have Apple cider vinegar made by Heinz. I hope it’s a good one.